A Kids bedroom is a private room where they can usually sleep for the night or relax and play during the daytime. Convenience and comfort are primary with plenty of space to sleep and play. Similar to a normal bunk bed, the construction style of a futon bunk bed looks the same although there is one major difference. Instead of a mattress in the bottom bunk part, a futon bed has a seating area which can also be converted into a bed. Extremely useful for daytime use of the room, as it allows kids to play and sit comfortably to either do homework, watch television or play games. Then when night comes, with very little effort, this lower bunk area can be converted into a bed again. 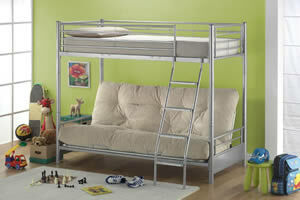 A futon bunk bed is pictured below in a typical childs bedroom and illustrates the practicality of this design. The frame on this bed is tubular metal and finished in a modern silver colour scheme. The actual model shown is a "Joseph Twin Futon Bunk Bed"